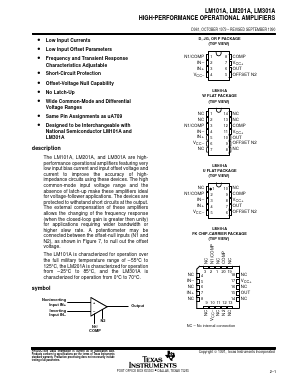 The LM101A, LM201A, and LM301A are high performance operational amplifiers featuring very low input bias current and input offset voltage and current to improve the accuracy of high impedance circuits using these devices. The high common-mode input voltage range and the absence of latch-up make these amplifiers ideal for voltage-follower applications. The devices are protected to withstand short circuits at the output. The external compensation of these amplifiers allows the changing of the frequency response (when the closed-loop gain is greater then unity) for applications requiring wider bandwidth or higher slew rate. A potentiometer may be connected between the offset-null inputs (N1 and N2), as shown in Figure 7, to null out the offset voltage.